The third meditation we will explore in the Free Online Guided Meditation E-Book is a widely used and accepted method for opening, activating and balancing the mysterious and powerful Ajna Chakra (Third Eye). It is the the potent AUM Mantra meditation technique. The Ajna Chakra or Third Eye, eye lies at the very top of spine in the medulla oblongata. It relates to the pituitary gland, the pineal gland, the nasociliary nerve plexus and frontal lobes of the brain. Each chakra can be activated by several means. In this meditation we will use the physical trigger point of the chakra (kshetram) as a point of concentration to activate it. In addition, each chakra is associated with a particular seed sound (Beej Mantra) which can be utilized to awaken it. 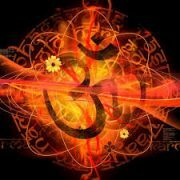 For the Ajan Chakra the Beej Mantra is the primordial sound “OM” (AUM) and this meditation will be using that as well. There are many variations to OM (AUM) Mantra chanting for the activation of Ajna Chakra. I will provide a variation that only requires silently chanting OM Mantra and therefore can be practiced almost anywhere. Follow all steps from the guided meditation above except instead of chanting OM (AUM) Mantra out loud, as you inhale chant “Oh” silently, while visualizing the sound flowing into Ajna Chakra from your forehead and then silently chant “Mmmm” as you exhale, visualizing the sound leaving your forehead from Ajna Chakra. The rest is the same as the meditation above. Many women today are actually practicing Ajna Chakra Meditation without even knowing it. This is resulting from the tradition of wearing a bindi. A bindi is the colorful decorative dot placed in the middle of the forehead and was designed originally to provide continual stimulation to Ajna Chakra by way of its Kshetram (physical trigger point). So next time you wear a bindi, remember that not only does it look oh so fine, but it is also raising your level of awareness and consciousness – not bad for a dot. What you published was very logical. But, think about this, suppose you typed a catchier post title? I ain’t saying your content isn’t good., but suppose you added a title that makes people desire more? I am doing from 2 months mantra chanting through mind (silently) and i have tried to remember this mantra om eac every moment. benefits of this mantra, i feel my breath have become calm and long. and nowadays feeling happiness with each breathing. and recently i started yogic exercise (ajna chakra meditation) as you told. and i have stated one more thing that i try to concentrate my ajna chakra whenever i got free time with daily activity. i am getting more consciousness with this yogic exercise, more clear mind too. but i am experiencing my body started to create more urination comparable to previous time but it is noted that it is not frequent. should body start purifying body when we do such yogic exercise? I heard it is dangerous to awaken third eye with out proper guidance is it true? If it is true can I follow this meditation? Please guide me in marathi language that how I can open my seven chakras in my body tell me easy methods. ……. it is the time for awake your power…..
just come for meditation with me, i will show you the power of your chakra, and it going to awake. if you need to experience it, come with pkanoopkumar@gmail.com. Raising of the kundalini has been simplified with the touch of master. You can learn this through any SKY center nearby. pls send the Chandra meditation techniques in Hindi thanks! Help to activate kundalini shakti..to help others. .
Namaste and thank you so much for this, which I will use as my saddhana. My yoga practice has deepened in the past month (due to winter) and I have had five psychic occurences lately, including predicting the pregnancy of a girl in my Sunday School class. I will use this AUM ajna opener to expand my abilities and potentially control the premonitions. Thanks and Sat Nam! These techniques helps us to get Patient and the chakras clean. Thanks very much! thanks for the lot of tips. They are very useful. Introduction To Guided Meditation & Kundalini Yoga Class Syllabus –... How to Find Your True Guru?